This week I have been focusing on lessons that we need to teach the little girls in our lives, in order to raise up the next generation of strong, confident, and powerful women. Not one of us is perfect, but through the trials of life, we have all learned a lot that can be used as a tool for how we choose to parent or guide these little ladies. Don’t get the wrong impression here; ultimately, when she is old enough to go through some of life’s hardest challenges, you will not be able to make the choice for her. Our little ladies will make their own mistakes. But it is amazing what a difference words can make. You can always have the conversation, and remind her of things, teach her lessons, and open her eyes in a way that could potentially save her from a life full of pain. There are a million lessons you could teach her, but here are some very important things she should know. Maybe her father walked out on her, or maybe a boy cheated on her, broke her heart, and left. These moments tend to try and define us. However, it is important for your little lady to know that his actions DO NOT define her life. Just because that man walked away, it doesn’t mean she is broken. She doesn’t need to spend the rest of her life chasing after love to fill a void—she is whole. Just because a boyfriend cheated, doesn’t mean there’s something wrong with her or that it’s her job to fix him or do something to make him stay. We also allow the presence of a man to effect our actions and behaviors. Teach your little lady, just because the boy she likes walked in the room, it doesn’t mean she has to be someone she’s not. It doesn’t mean she has to do things she doesn’t want to do. She doesn’t have to be afraid or intimidated. And she doesn’t have to accept abuse of any kind! Teach her that she is whole; she is creative, wise, strong, and so worthy of love and all things good. 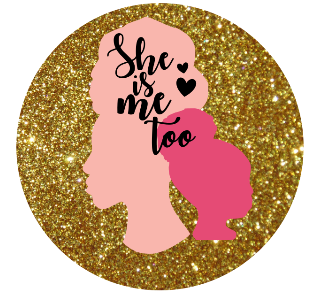 When they’re intimidated by us or don’t understand us, they say we’re “too much.” When they don’t get their way or feel incompetent, they say we’re “not enough.” Teach the little lady in your life that she doesn’t need to measure up to anything or anyone. These hurtful words that people say will make her think that she needs to be different to fit some mold. It could ruin her confidence and cause her to sit down and be silent. But she was born to stand up and stand out. God made no mistakes when He created her. She is everything she needs to be for such a time as this! From an early age, we develop the feeling of shame. Whether it’s because of something we were teased about or a negative comment from a parent. And so we try to hide our true self. We start to create our masks. To be someone other people want us to be. The facade can be formed when we are young and continue on throughout life, to the point where we believe it. We believe the mask is who we are, and forget how to remove it and that it wasn’t what God intended for our lives. We start making excuses for people who hurt us or for our own destructive behavior. We allow ourselves to believe that we deserve all the bad that has happened to us. Let your little girl know, that’s a LIE! Little girls are fearless until someone kills that spark. So fan her flame! You can help her grow and know who she truly is. With such courage, she will be able to sniff out a snake, call it like she sees it, and be SECURE in the fact that she will not be consumed! When your little girl knows and loves herself, she will grow into a woman who respects herself. She will gain the confidence to walk in truth, know her worth, and not settle of less. People will try to make her feel unimportant, or as if she’s only good for one thing. In the words of Lauryn Hill, “that thing.” But she is so much more! She deserves to be taken seriously. By men, by professionals, in life. She will be a valuable asset wherever she chooses to place her efforts. Fun is good, but teach her to never downplay her abilities, her talents, her intelligence, or anything she has to bring to the table! Empower the little ladies in your life. Many of us have been through enough to know how to add to their light and not to their pain. Build her up and remind her of who she was born to be. Be confident in the abilities that God gave you to raise or influence this little girl’s life. Allow your past to be your story and not your shame, so that it may be an inspiration to her and a constant learning opportunity. Expose her to experiences that encourage her to dream! Speak life into her. And more than anything, let her know that you love her. Please share this post on your social media sites!